A senior leader of the Muslim Brotherhood-aligned Egyptian Americans for Freedom and Justice (EAFJ) on Tuesday lamented the anniversary of the death of Mohamed Kamal, who is believed to have led the Brotherhood's military wing. Kamal, a member of the Muslim Brotherhood's Guidance Bureau, died in a shootout last year with Egyptian security forces. It was a year ago that "the criminals in Cairo have announced the assassination of the leader of the revolution, the Martyred Doctor Mohamed Kamal and his companion, the hero and martyr Yasser Shehata," EAFJ spokesman Mahmoud ElSharkawy wrote on his Facebook page. Egyptian authorities believe that Kamal created a network of Muslim Brotherhood-linked terror groups have carried out attacks since 2014 – sometimes claiming joint responsibility along with ISIS. That includes a May 2016 attack on Egyptian police near Cairo by the Revolutionary Punishment Movement (RPM). Kamal's Hassm Movement claimed responsibility for an attack against the Myanmar (Burmese) Embassy in Cairo earlier this week. 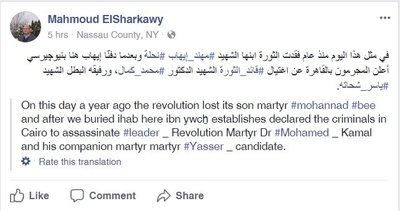 ElSharkawy's post came shortly after the Muslim Brotherhood posted its own eulogy for Kamal on its official Facebook page. The Brotherhood's eulogy placed Kamal on par with its founder Hasan Al-Banna, Sayyid Qutb and recently deceased Supreme Guide Mohamed Mahdi Akef. All of these men preached violent jihad against the Brotherhood's enemies. Senior Muslim Brotherhood leader Ashraf Abdelghaffar in August called on Brotherhood members to return to al-Banna's violent jihadist traditions. The Brotherhood statement promised "that vengeance for the blood and dignity is a debt and a pledge that we will not abandon, the time for punishment is coming, and your fortresses and castles will not stop us, you will see what you were warned against from us, we will come out for you from every lane, every street and every square, we will destroy your fortresses from above and from below. You will find the revolutionaries where you never expected. Allah Is Greatest." ElSharkawy's group, EAFJ, opposes the Egyptian government which ousted the Muslim Brotherhood from power in 2013 and "seeks to put pressure on the American administration to stand by democracy" in Egypt. But it has close connections with the Muslim Brotherhood and EAFJ members frequently declare their support for the Brotherhood, as they did during last week's memorial service for former Supreme Guide Mohamed Akef. Egypt's Al Bawaba newspaper identified ElSharkawy in 2015 as a member of the International Organization of the Muslim Brotherhood who allegedly helped fund these groups in conjunction with exiled Brotherhood members in Egypt and Qatar.